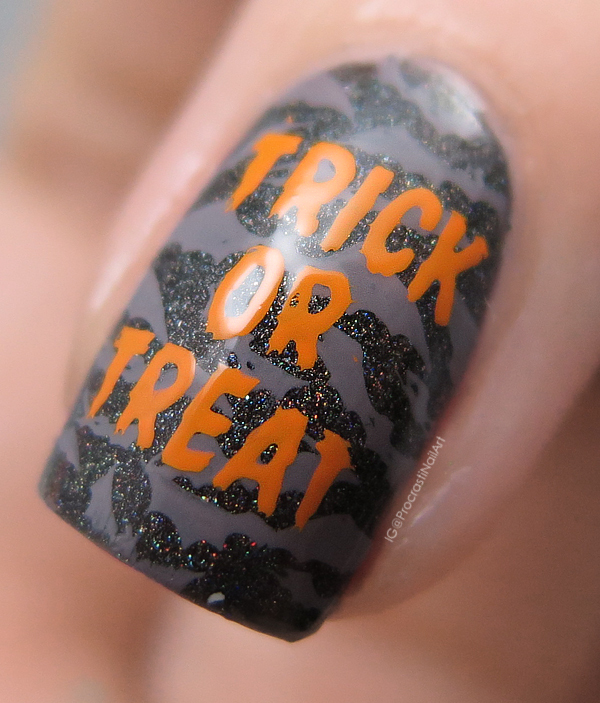 Nail Art // Trick or Treat Stamped Mani for Halloween! Happy Halloween, everyone! I hope you all get to enjoy some candy and spooky costumes tonight. 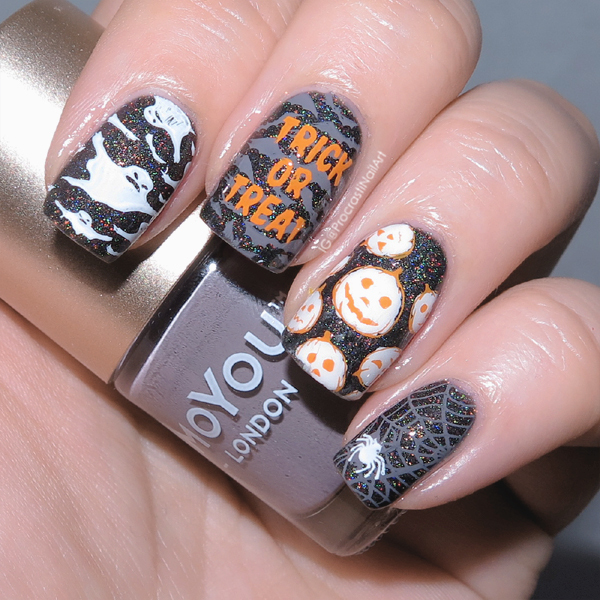 :) I'm having a quiet night in with cake and movies and my pj's, and I also did some spoopy (is that still a thing) nails to celebrate! Okay, so let's break down this mani before we look at more pics! My base is a black scattered holo from Julep called Ebony which I stamped over with MoYou London Falcon, Mundo de Unas White and Mundo de Unas Sunflower! 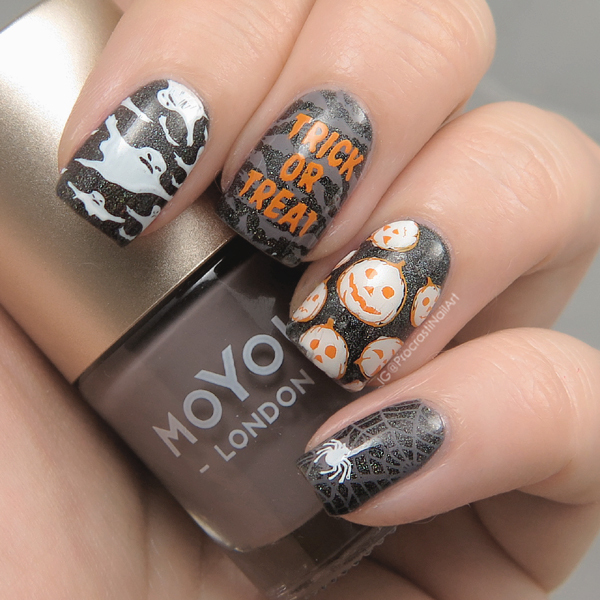 All of the images I used were from my new MoYou London Festive Collection 16 Plate (originally reviewed here)! I like that I used a mix of techniques... Basic stamping, stamping decals, double stamping... It was lots of fun to do! 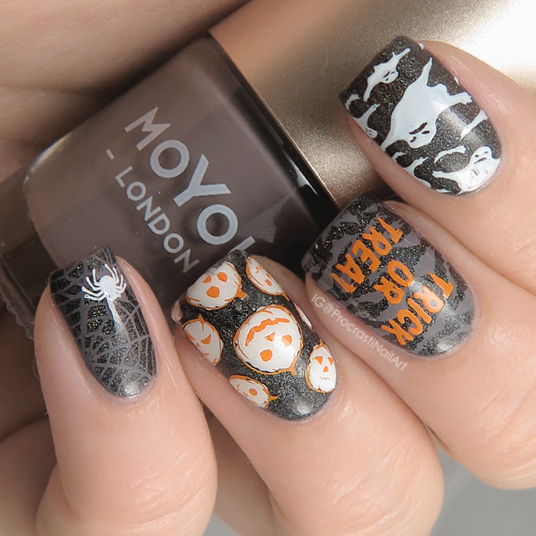 My favourite nails are the spider web and the 'trick or treat' which has bats stamped for the base! The holo in Ebony didn't want to show up with my regular lightbox (I find in general Julep's holos aren't bold enough to get a good holo shot without flash) so I decided to take one lobster-fingers flash shot for you to see how truly gorgeous this base is. I really really love these, and I like that they let me put my new Halloween plate to good use before retiring it to switch out my Christmas plates. ..... EXCEPT I actually have one more Halloween look to share with you, and I'm not going to get time to post it until later this week. So I'm not actually done with Halloween yet, surprise surprise! All the different Halloween designs are fun. I really like the cobweb and spider one the most. Your stamping is fantastic! Almost looks like you just used stickers. I'm jealous of your skills! can we do Halloween forever? 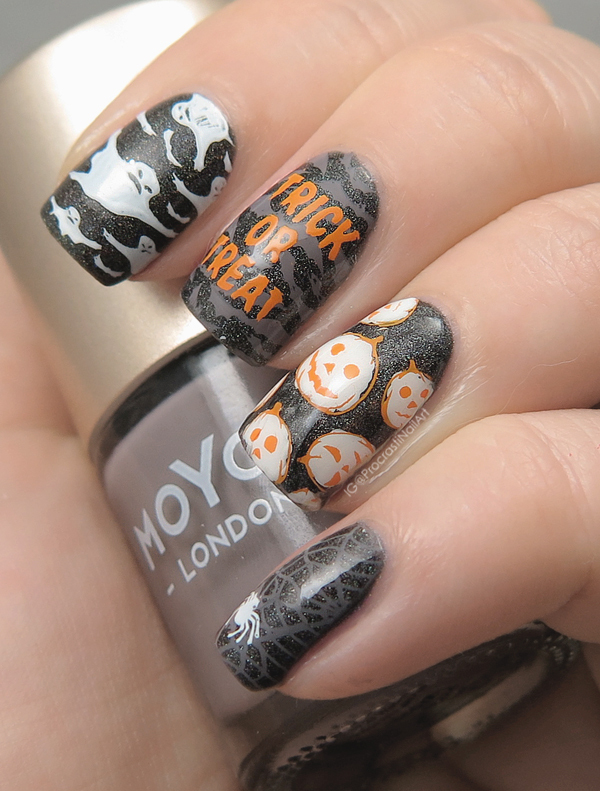 This is one of the cutest, spookiest Halloween mani I've seen! Loe the stamping but that base is what's making me drool! Don't let me think of Christmas manis already!!! This one looks great! I love these! 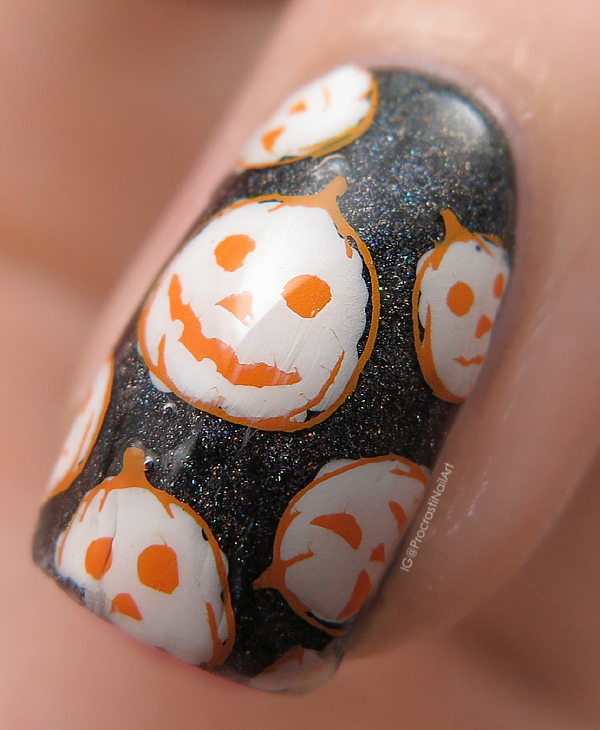 Especially the trick or treat nail and the jack-o-lanterns! I love that you did white pumpkins! How perfect! I love how you layered the stamps!